I read this book I need to talk about…. 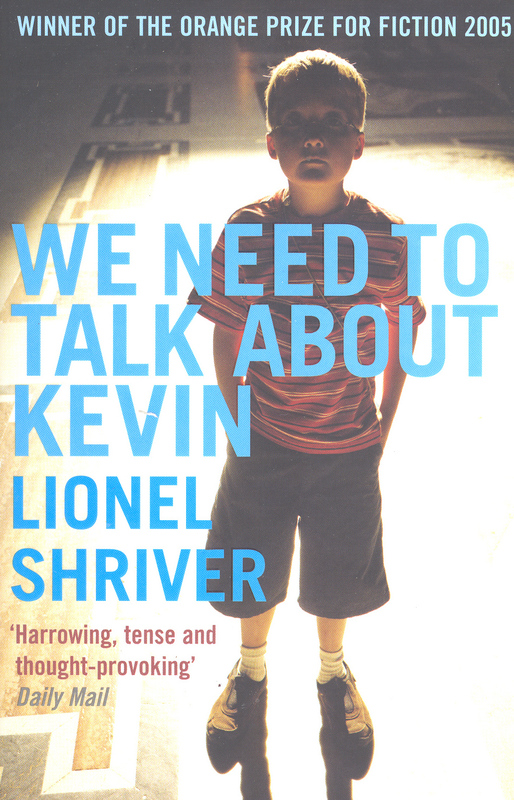 Many of you would never have heard of Lionel Shriver and a book called We Need to Talk About Kevin. Browsing through my local library tonight I came across this book on the shelf and I immediately went home to write about it. I purchased this book in 2007. I read about 50 pages and I could not read the book any further. This was one of the most difficult books I have ever read. To quote Cameron Woodhead from The Age, We Need to Talk About Kevin is the story of Eva Khatchadourian’s retrospective account of her son’s life up to and beyond the day he went to his high school and began shooting his classmates. The book takes the form of exquisitely crafted letters written by Eva Khatchadourian to her former husband, Franklin, who leaves her just before her worst nightmare comes to life. Three days short of his 16th birthday, Eva’s son, Kevin, shoots seven of his fellow students in the school gym and watches with grim satisfaction as they bleed to death. In her letters, Eva attempts to discover why Kevin became a killer by examining her domestic life. Before Kevin came along, Eva and Franklin were happy for a while. Franklin was a location scout for TV ads who could find a slice of Paris in Pennsylvania: an unabashed patriot, a staunch Republican, a believer in the American dream. Eva was a lifelong Democrat who loathed America, the parochialism of its people and the arrogance of its foreign policy. A successful businesswoman, she made her fortune publishing budget-travel guides, after much compulsive globetrotting in her 20s. In many respects they were chalk and cheese, but very much in love. Still, the decision to have children did not come naturally, at least not to Eva. Franklin saw children as the answer to “the big question” (a question he spent much of his own life avoiding). Eva acquiesced out of vanity: she wanted to prove that she could be a good mother. She was destined to fail spectacularly. Eva became despondent, a feeling exacerbated when Franklin orchestrated a move from their Tribeca apartment to a house in the ‘burbs. Eva interprets Kevin’s misdemeanours as early signs of psychological abnormality. She believes that he deliberately refused to stop wearing nappies. She is convinced that he incited his kindergarten friends to anti-social behaviour. Later, she is appalled by his cruelty to an unfortunate-looking girl at a primary school dance. But if Eva was always suspicious of the kind of person Kevin was growing up to be, in Franklin’s eyes he could do no wrong. As Kevin develops into a sullen, manipulative teenager, his parents’ difference of opinion became more pronounced. Eva starts to actively dislike Kevin. And his behaviour deteriorates in response: he masturbates in front of her, throws bricks at cars, and is the prime suspect in his little sister’s mutilation. Whether Kevin was born bad, or was failed by his parents, is a question that Eva cannot ultimately resolve. All she can do is narrate what happened, and continue to visit her son in prison. Indeed, these prison visits are among the most sublime and heart-rending passages in the book (source). Here, Shriver’s book takes an interesting right turn. Kevin (at least in the account of him presented us by Eva) turns out to be the kind of child who would have both Damian (the kid in The Omen) and baby Hannibal Lecter bawling for their security blankets. Importantly, this is how he is right from the outset (which means it isn’t the result of his mother’s attitude towards him). He’s positively demoniac – frighteningly precocious and aware, yet uninterested in everything; completely bereft of attachments, yet with a fearsome propensity for malice. No babysitter can handle him for any length of time. Classmates and even teachers are frightened of him for reasons that can never be properly explained. He has the power of influencing people to do things that are bad for them. Eva can see this side of him; Franklin, who truly IS in love with his child, can not (source). I found reading this book really hard going, particularly at the beginning. I did not think I would be able to complete reading this book as it is written in the form of letters but the story did eventually draw me in. I struggled to enjoy the book at the beginning because I found it too “wordy” to grip me. I stopped reading the book and then forgot about it. Eight months later I re-commenced reading the book. I did start from the beginning and I was determined to finish it this time. I became hooked once I got halfway and I finished reading the book in a day. We Need to Talk About Kevin is one of the most unusual and thought provoking books I have ever read. Emotionally gripping and very sad, the book was more “high brow” than those I usually read. It is very different to the average novel however in the end I found it a fascinating and compelling read – an insightful study of an unusual subject. Due to the tragic American high-school massacres that have taken place in recent history, I believed I was reading a true story. It wasn’t until I read half the book I realised I was reading a piece of fiction. Shriver takes the reader through a searing and complex look at the reasons couples decide to have children, the parent-child relationship, marriage, and the limits of love and loyalty. We Need to Talk about Kevin raises so many issues – about the nature-nurture debate, about family units made up of very different individuals who have to find a way to coexist and about upper-class hypocrisies. The final, chilling paragraphs will painstakingly leave you clinging for more. Do yourself a favour and go to your local library and hire it. You won’t regret it. If you have you read this book before please share your thoughts. If not, are you interested? ~ by Shae on February 5, 2010. Hi Shae, have read this blog a couple of times, I might just have to go to the library and get this book. Although I think this book is in my “top 5 books ever read list”, I am selective about who I recommend it to. It is a tough read not for the faint of heart, but worth it. Really challenges our perceptions about mothers and motherhood. It still haunts me. You nearly convinced me to read it. Alas, I have 2 young boys and cannot stand such confronting content. It simply freaks me out. I’ll have to content myself with your synopsis. It’s an excellent review. I really LOVE this book. It is one of my favourites. Not an “easy” read but well worth it. Excellent review by the way! It is a great book. In the end I thoroughly enjoyed it!! But you’re right – it wasn’t an easy read! !